The impacts of the environment on human affairs has remained a generally unexplored area in histroy. 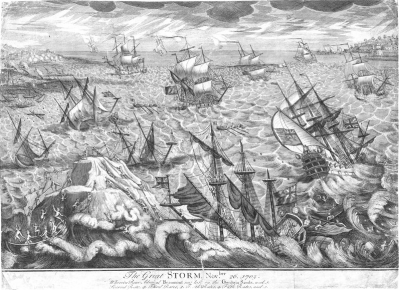 Engraving of the Great Storm of 1703, author unknown. For FIU Ph.D. student Jason Daniel, a life-long interest in maritime and colonial history led to a research project on Great Storm of 1703, one of the most severe natural disasters ever recorded in British history. 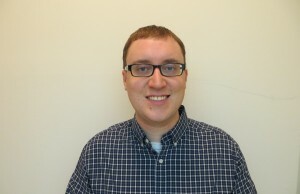 His efforts were recently recognized by the Midwest Conference on British Studies, a scholarly society dedicated to all aspects of the study of British civilization. The Great Storm of 1703 caused extensive flooding in southwest England, drowning hundreds of people and livestock. In London, it blew the lead roof off Westminster Abbey. Ships were blown hundreds of miles off-course or wrecked at sea. The Royal Navy was badly affected with the loss of vessels and the death of nearly 1,500 seamen returning from the War of the Spanish Succession (1701-1713). “When I realized this storm was an event that, while often briefly addressed in many scholarly sources, contained a significant outcome that seemingly few historians had explored in detail. It hit me this was a project I could make a contribution,” Daniel said. Daniel’s research explores how the Great Storm served as a catalyst for administrative reform in the British Navy when the government paid the families of the seamen who died. This became the first instance of compensation given to families of those lost in naval service other than combat — an indication of the growing role sailors played in the country’s national identity. Although removed by hundreds of miles and years in time, Daniel argues the Great Storm is relevant today because it is an early example of government responsibility to those lost in service. Daniel admits he himself had not heard of the Great Storm of 1703 until he took “Advanced Readings in Atlantic Civilization” and “Advanced Readings and Research in Atlantic Civilization” as a graduate student. Taught by history professors Noble David Cook and Sherry Johnson, the two-semester research seminar required original research that would culminate in final a paper.